A synergistic hybrid of two treatment processes, managed aquifer recharge (MAR) combined with ozonation, was proposed for wastewater reclamation and water reuse applications. Batch reactor and soil-column experiments were performed to evaluate reclaimed water quality using various chemical and bacterial analyses. The ozone process was optimized at low ozone dose (0.5 mg O3/mg DOC) based on the control of N-nitrosodimethylamine (<5 ng L−1) and bromate (<10 μg L−1), and applied prior to (i.e., O3-MAR) and after MAR (i.e., MAR-O3). 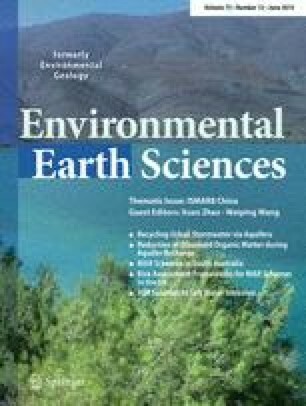 This work demonstrates that effluent organic matter (EfOM) and trace organic contaminants (TOrCs) are effectively removed during the hybrid process of MAR combined ozonation, compared to MAR only. Based on fluorescence excitation–emission matrices analyses, both MAR and ozonation reduce soluble microbial (protein-like) products while only ozonation contributes in reducing humic and fulvic substances. Even at low ozone dose of 0.5 mg O3/mg DOC, the O3-MAR hybrid significantly reduced UV absorbance by ≥2 m−1, BDOC by ≥64 %, and total (Σ) TOrC concentrations by ≥70 % in the effluent water quality. However, no significant improvement (<10 %) in the removal of Σ16 TOrC concentrations was observed for the increased ozone dose at 1.0 mg O3/mg DOC during MAR combined ozonation processes. Overall, O3-MAR was effective by 10−30 % in treating effluent water than MAR based on DOC, UV254 nm EfOM, TOrC and bacterial analyses. In addition, MAR-O3 was better than O3-MAR for the reduction of fluorescence (close MQ), TOrCs (≥74 %) and total bacteria cell concentrations (>3 log reduction). Therefore, implementing MAR prior to ozonation appears to remove the bio-amenable compounds that react rapidly with ozone, thereby reducing oxidant demand and treatment efficiency.